I am up at Gettysburg with my students today, so I am posting the final excerpt from the chapter of my Gettysburg text that I have been posting throughout the week. This section wraps up that chapter and discusses the treatment that Abner Doubleday received from George Meade and the subsequent myth surrounding Doubleday and the invention of baseball. The irony about Doubleday is that he is best remembered for a game that he did not invent, and his most heroic performance is forgotten and dismissed. I hope you enjoy. On the other hand Abner Doubleday proved himself as a capable commander who was able to provide effective leadership during a crisis situation. Although he is one of the most under-appreciated Union commanders at Gettysburg he “ably rose to the occasion, as did divisional commanders James Wadsworth and John Robinson.”  Though his abilities were suspect, especially by George Meade and Colonel Wainwright, the Corps artillery commander Doubleday managed to hold off superior Confederate forces, and even inflicted a significant defeat on the divisions of Harry Heth and Robert Rodes. During the fighting against ever increasing numbers of Confederates, First Corps inflicted massive casualties on their opponents. “Seven of the ten Southern brigades incurred casualties from 35 to 50 percent, and the total for all brigades came to an estimated 6,300 officers and men, or about 40 percent of their strength.”  Doubleday’s troops held on long enough to support the left flank of Eleventh Corps as it was being assaulted by Early’s division. He left the Army of the Potomac never held a field command during the war, however, he was brevetted in the Regular Army to both brigadier and major general. Doubleday served in administrative capacities in Washington D.C. until the end of the war and testified against Meade during the politically charged hearings of the Committee on the conduct of the War. Doubleday remained bitter toward Meade and he “was never reconciled to Meade’s relieving him as acting commander of First Corps in Favor of Maj. Gene. 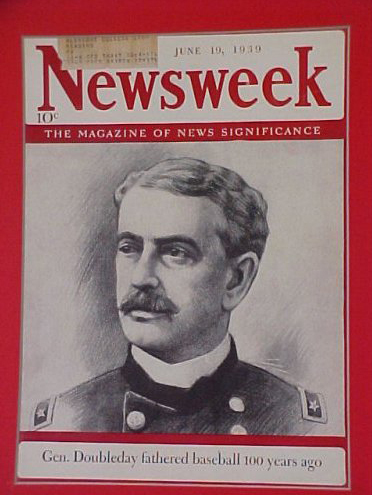 John Newton, who was his junior in rank and the reproach that it implied.”  After the war Doubleday reverted to his rank as a Colonel in the Regular Army and was made Colonel of the 35th U.S. Infantry in San Francisco. From 1871 until his retirement in 1873 Doubleday commanded the African American “Buffalo Soldier” 24th Infantry Regiment in Texas. He died in New York on January 25th 1893, and was buried in Arlington National Cemetery. Among the members of the honor guard at his funeral in New York was a man named Abraham Mills who would play a major role in Doubleday’s future fame. Like the Civil War, Baseball too is filled with myths which connect it to our culture, and one “is the myth that Abner Doubleday invented the sport one fine day in 1839 at the farmer Phinney’s pasture at Cooperstown.”  It was early American baseball star Albert G. Spaulding who linked the creation of baseball to the Civil War and in particular to Abner Doubleday by way of an apocryphal story of one of Doubleday’s childhood friends, years after Doubleday’s death. 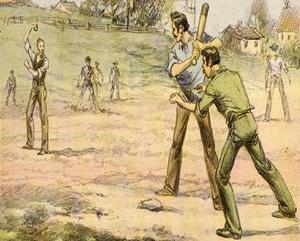 In 1907, Spaulding worked with Abraham G. Mills the fourth President of the National League, the same man who had served in Doubleday’s funeral honor guard to conclude that “that the first scheme for playing it, according to the best evidence obtained to date, was devised at Cooperstown New York, in 1839.”  But this is simply myth and the under-appreciated hero of the first day of battle at Gettysburg is much better known for something that he did not do.